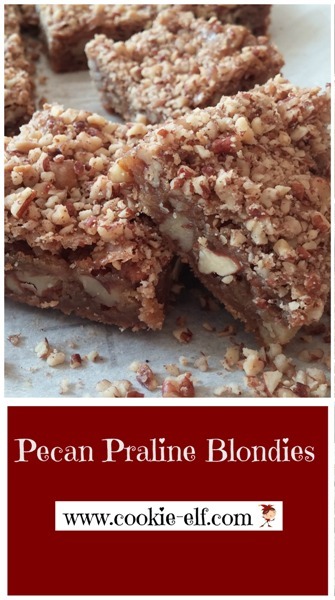 Pecan Praline Blondies are a simple bar cookie recipe. The bars call for just 7 ingredients. The dough is mixed together entirely on the stovetop, making for an easy clean up. But don’t let the recipe’s simplicity fool you. These rich, buttery bars will become a favorite if you love pecan pie, pralines, or anything caramel. The recipe calls for brown sugar as its main flavoring – hence the bars’ classification as a “blondie” – rather than the customary cocoa or melted chocolate which typifies brownies. The result is a rich caramel-and-nut bar with dense texture that comes from cooking brown sugar and butter together, a flavor long associated with praline candy. Pralines, a confection made from nuts and carmelized sugar syrup, originated in France. Settlers brought the concoction to the southern U.S., where the prevalence of pecan trees made the pecan-praline pairing quite popular. Preheat oven to 350º F. Line a 9 x 13 baking pan with parchment paper, allowing ends to extend over two sides of the pan. Grease the parchment paper. Set the pan aside. In a large saucepan on the stove top, melt butter on low heat. Stir in brown sugar. Continue to cook mixture on medium low heat for about 5 minutes, stirring constantly, allowing the mixture to eventually bubble slowly. Remove from heat. Add eggs and vanilla, mixing quickly with a large spoon to incorporate them thoroughly. Add in flour and baking powder. Mix quickly to avoid lumping in the dough. Fold in two cups of coarsely chopped pecans. Pour the mixture evenly onto bottom of the prepared baking pan. Dough will be sticky. Sprinkle ½ cup finely chopped pecans over the surface of the bars. Bake for 25-30 minutes, when top is crisp and edges begin to pull away from the sides of the pan. Do not over bake. Remove the pan from the oven and allow cookies to cool completely on a wire rack. Pecan Praline Blondie dough is very sticky. Be sure to grease the parchment paper lining the baking pan using shortening, rather than simply vegetable spray, so that you can remove blondies from the pan easily. Use butter rather than margarine in this recipe in order to get the rich flavor associated with pralines. Make sure to beat the eggs with a fork before adding them to the heated mixture so that strings do not form in the dough. In order to slice bars as cleanly as possible, set the cooled baking pan in the refrigerator for an hour before cutting.